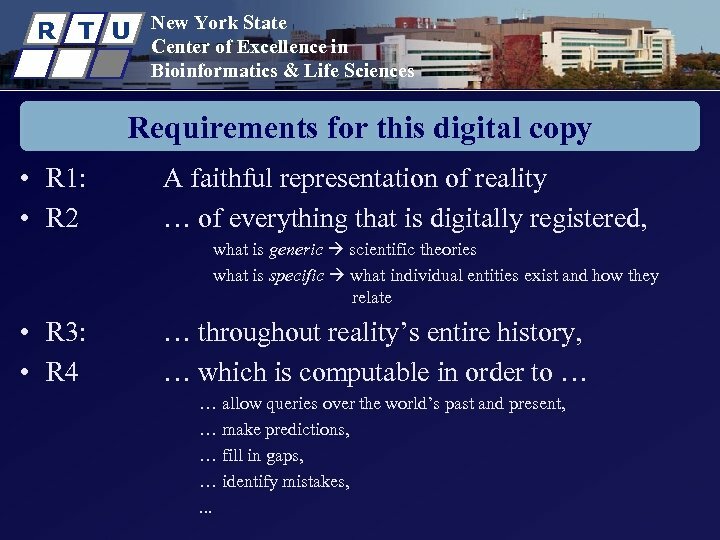 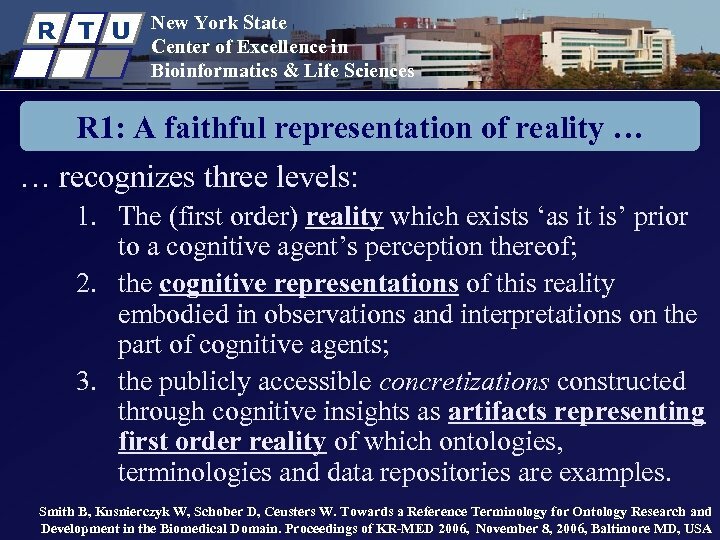 R T U New York State Center of Excellence in Bioinformatics & Life Sciences Requirements for this digital copy • R 1: • R 2 A faithful representation of reality … of everything that is digitally registered, what is generic scientific theories what is specific what individual entities exist and how they relate • R 3: • R 4 … throughout reality’s entire history, … which is computable in order to … … allow queries over the world’s past and present, … make predictions, … fill in gaps, … identify mistakes, . 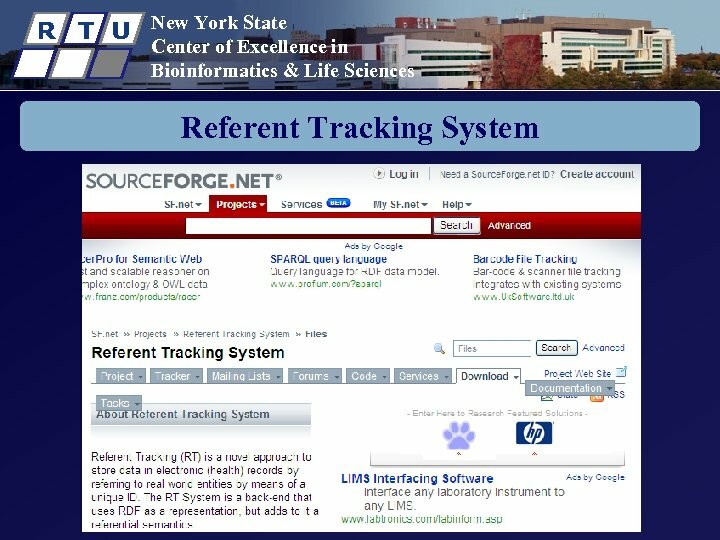 . .
R T U New York State Center of Excellence in Bioinformatics & Life Sciences Referent Tracking System Components • Referent Tracking Software Manipulation of statements about facts and beliefs • Referent Tracking Datastore: • IUI repository A collection of globally unique singular identifiers denoting particulars • Referent Tracking Database A collection of facts and beliefs about the particulars denoted in the IUI repository Manzoor S, Ceusters W, Rudnicki R. Implementation of a Referent Tracking System. 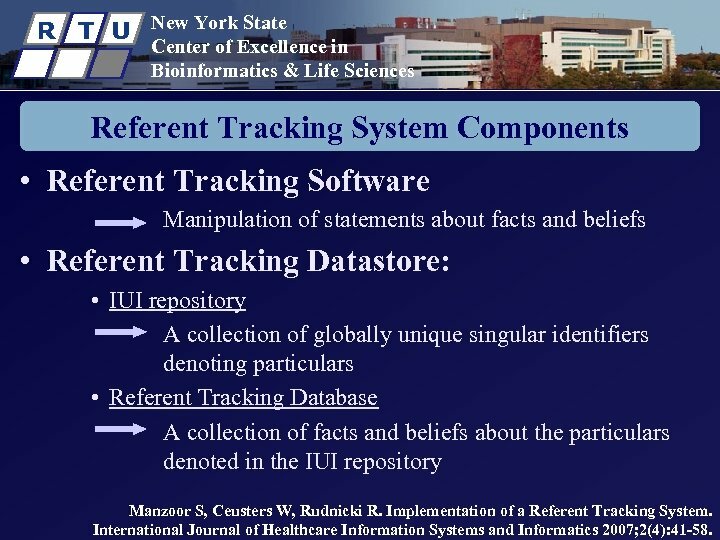 International Journal of Healthcare Information Systems and Informatics 2007; 2(4): 41 -58. 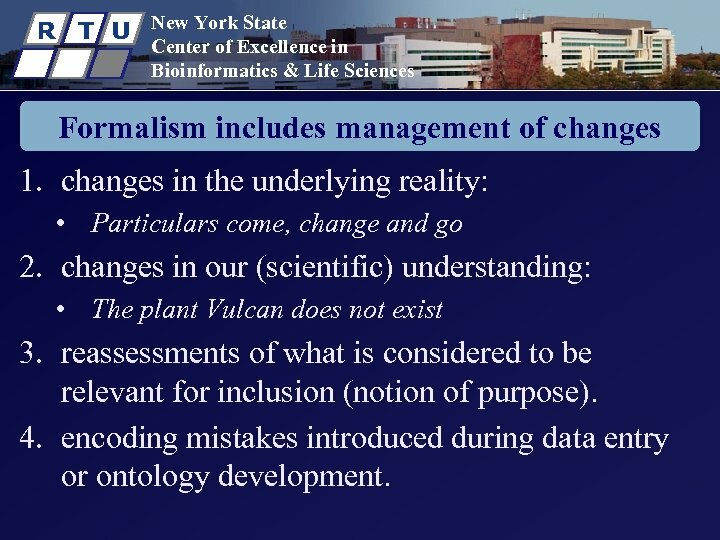 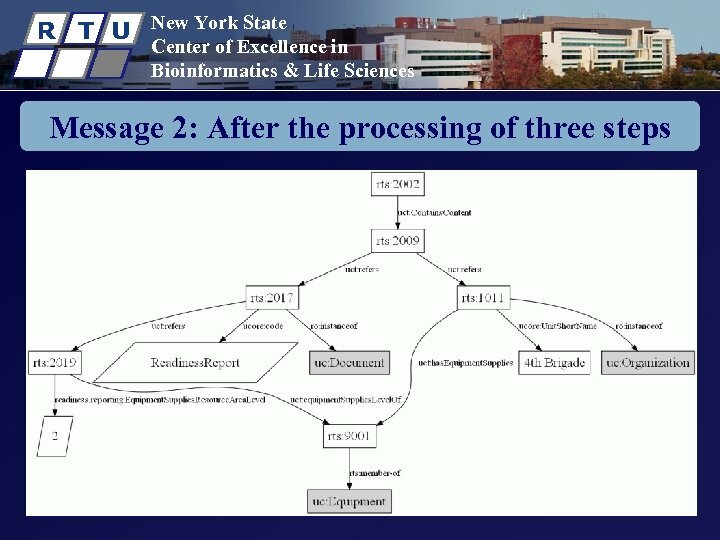 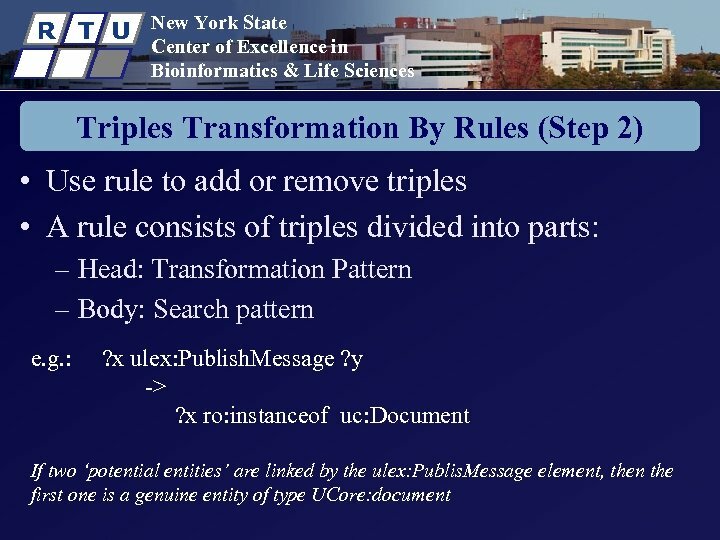 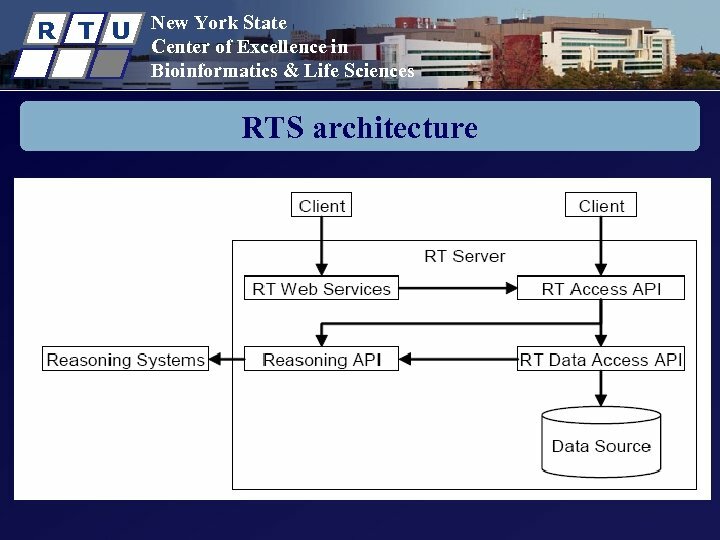 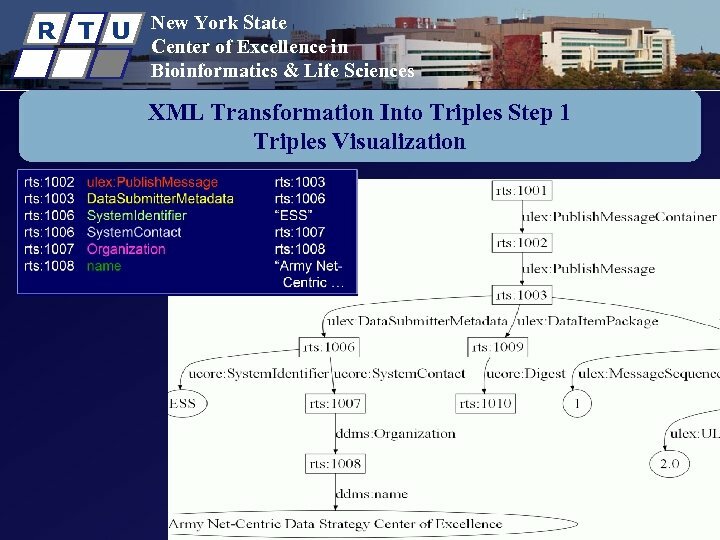 R T U New York State Center of Excellence in Bioinformatics & Life Sciences Formalism includes management of changes 1. changes in the underlying reality: • Particulars come, change and go 2. changes in our (scientific) understanding: • The plant Vulcan does not exist 3. reassessments of what is considered to be relevant for inclusion (notion of purpose). 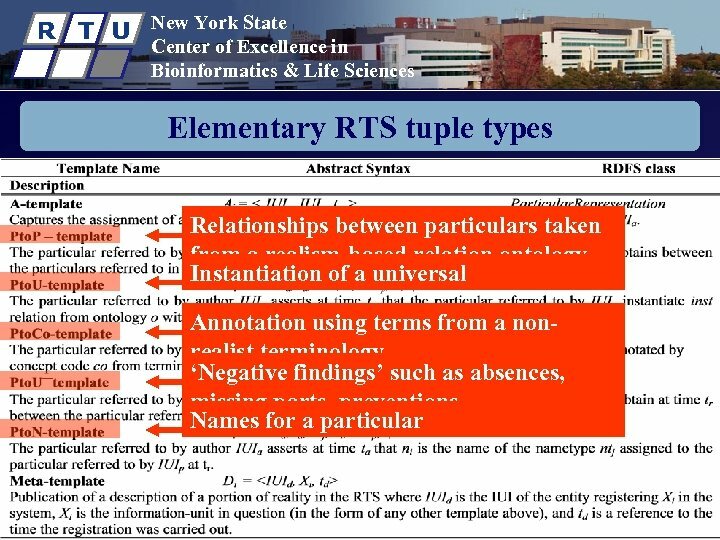 4. encoding mistakes introduced during data entry or ontology development. 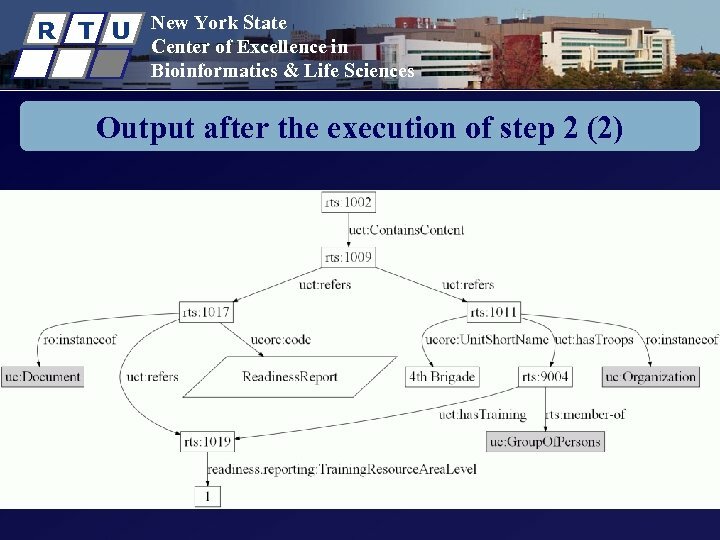 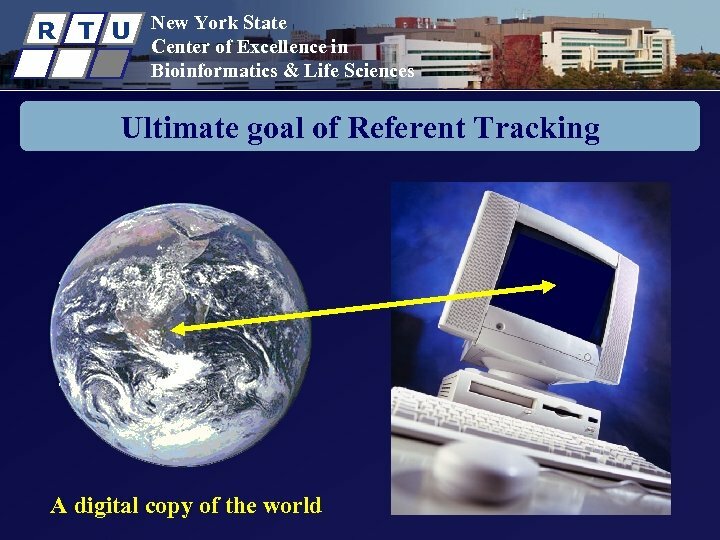 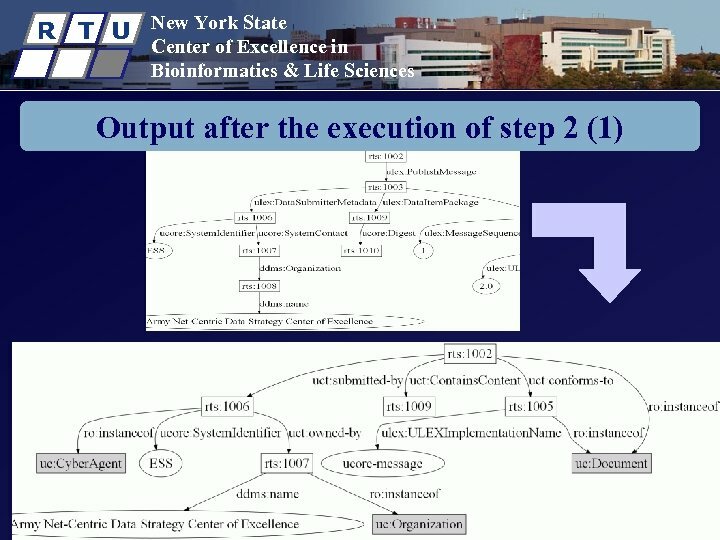 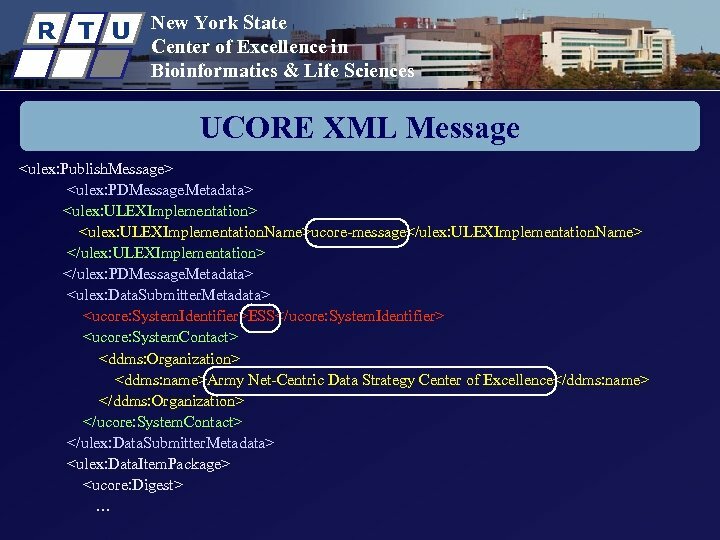 R T U New York State Center of Excellence in Bioinformatics & Life Sciences Tracking of Entities (Step 3) • Resolve whether an entity is already assigned an IUI or not. • Suppose that the middleware receives second message. 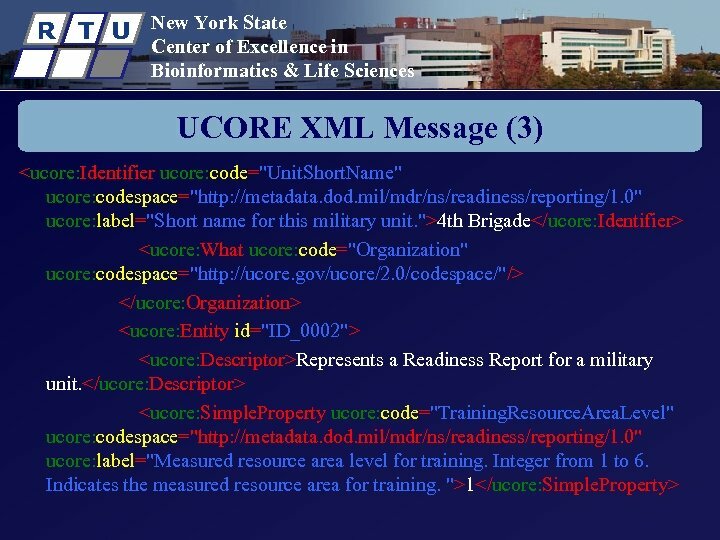 The message refers to the 4 th Brigade. 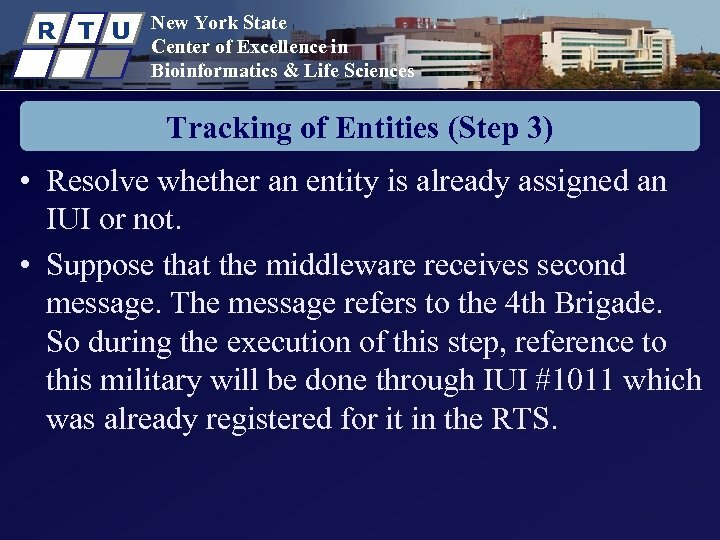 So during the execution of this step, reference to this military will be done through IUI #1011 which was already registered for it in the RTS. 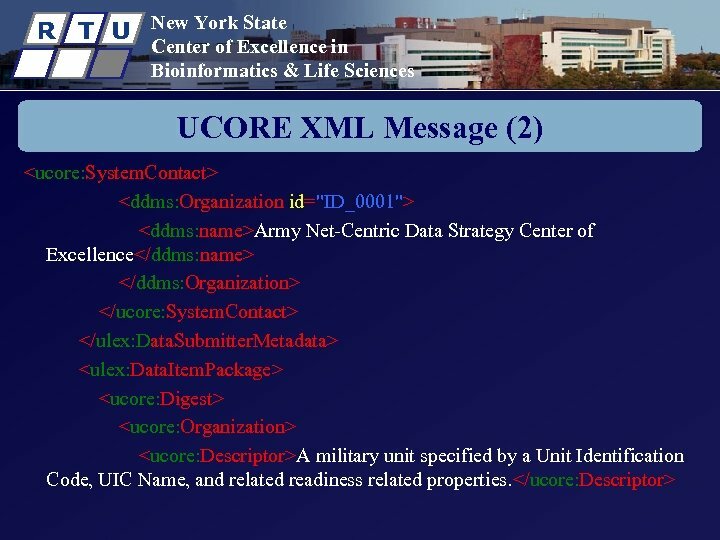 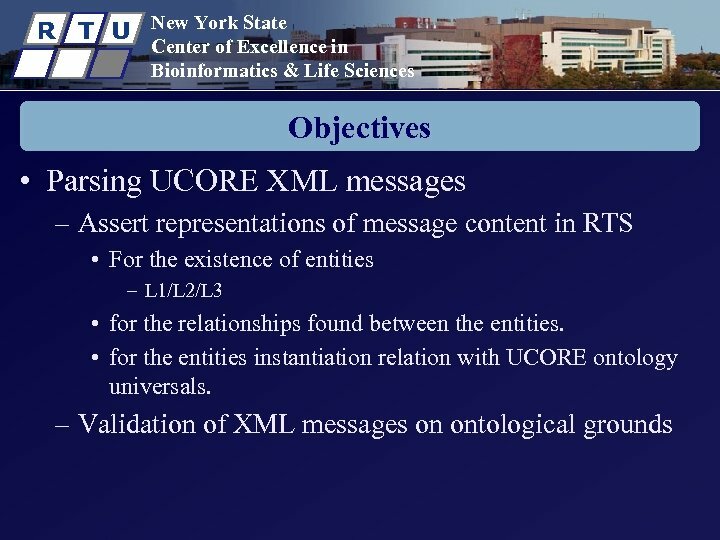 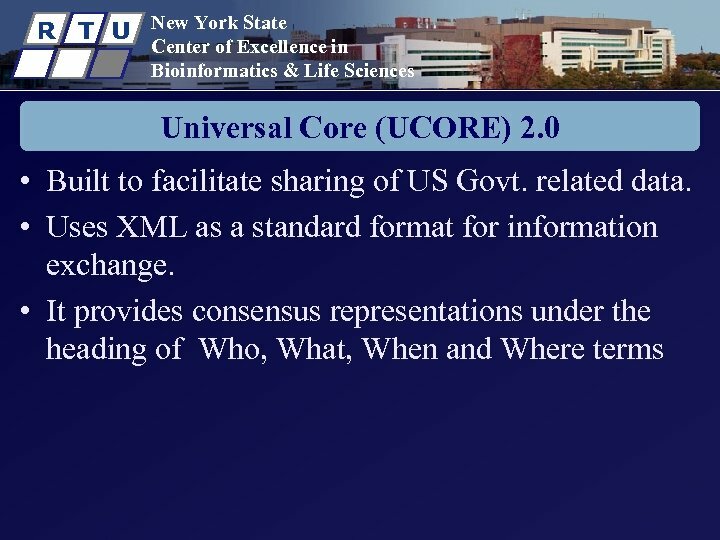 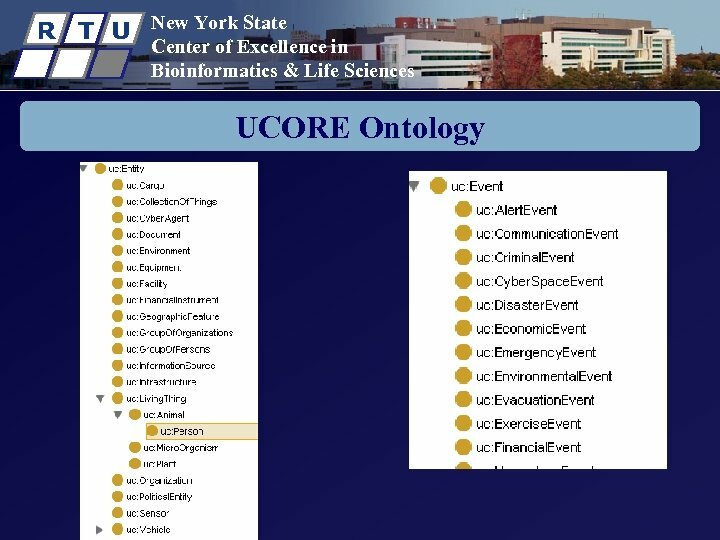 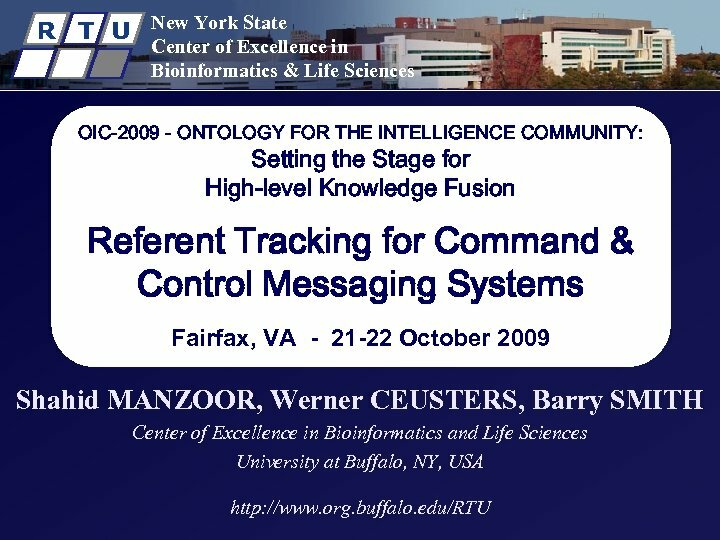 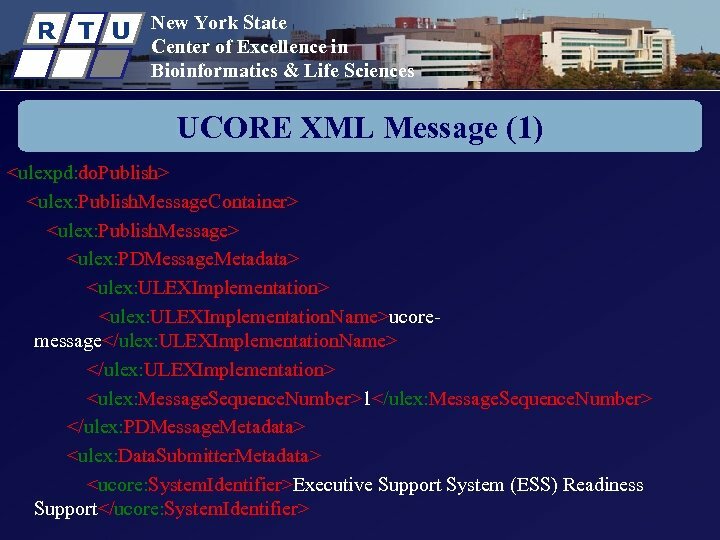 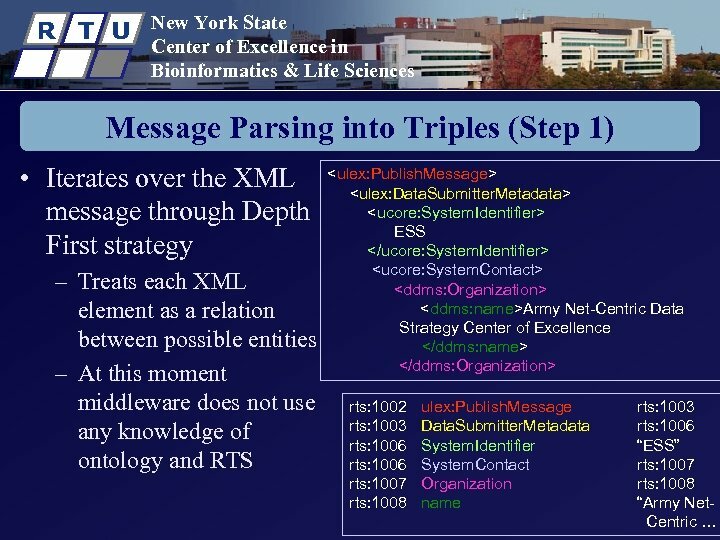 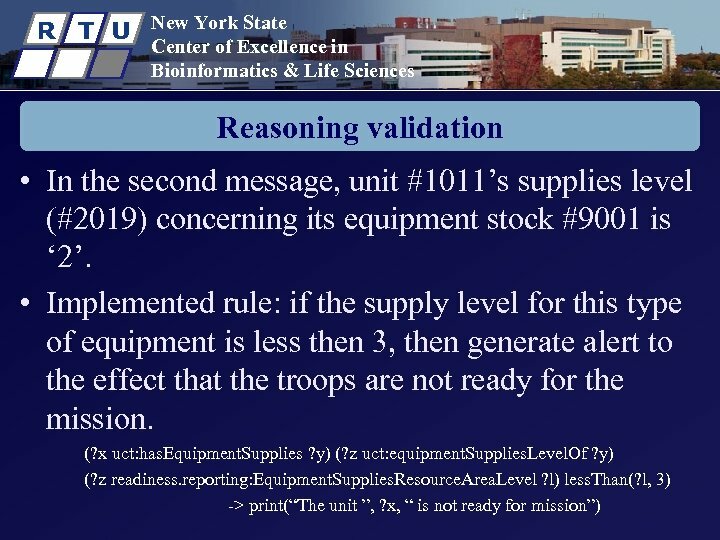 R T U New York State Center of Excellence in Bioinformatics & Life Sciences UCORE XML Message (2) Army Net-Centric Data Strategy Center of Excellence A military unit specified by a Unit Identification Code, UIC Name, and related readiness related properties.